Darko Bageski was born 1981 in Skopje. He started his education in music (primary and part of his secondary education) as a student in the DMBUC (State Music and Ballet Educational Centre) Ilija Nikolovski Luj in Skopje in Professor Jane Penov’s class. Further on, he graduates from his secondary school Pavao Markovac in Zagreb, Croatia in Professor Xhevdet Sahatxhija’s class. He continues his higher education at The Liszt School of Music Weimar, Germany in Professor Christiane Schpanoff’s class, and graduates within Professor Jurgen Rost’s class. Consequent to this he enrolls for his three-year post- graduation studies at the State Conservatory of Thessaloniki, Greece in Professor Gerhard Reichenbach’s class. He finishes his master exam in Professor Costas Cotsiolis’s class. In the course of his education he has participated in numerous professional masterclasses by eminent professors and pedagogues of classical guitar: Zoran Krajishnik (Serbia), Thomas Miller Pering (Germany), Laura Young (Canada), Zoran Dukic (Croatia), Aniello Desiderio (Italy), Nikita Koshkin (Russia), Ernesto Bitetti (Argentina), Carlo Marchione (Italy), Oddair Assad (Brasil). As a passive participant he has attended lectures of K. Markione, H. Kepel and A. Desiderio. He has also attended lectures in world music taught by Professor Thomas Fellow (Germany) and lectures in methodic of acoustic guitar taught by Professor Monica Rost (Germany). He has had many soloist concerts and performances in Macedonia, Croatia, Serbia, Bulgaria, Germany, Greece, Sweden and USA. Having performed as a soloist in many chamber orchestras and with the Macedonian Philharmonic Orchestra. 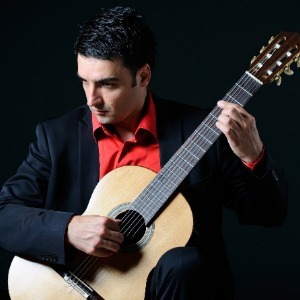 He currently works as a full time guitar professor at the Faculty of Fine Arts-Music in Skopje.